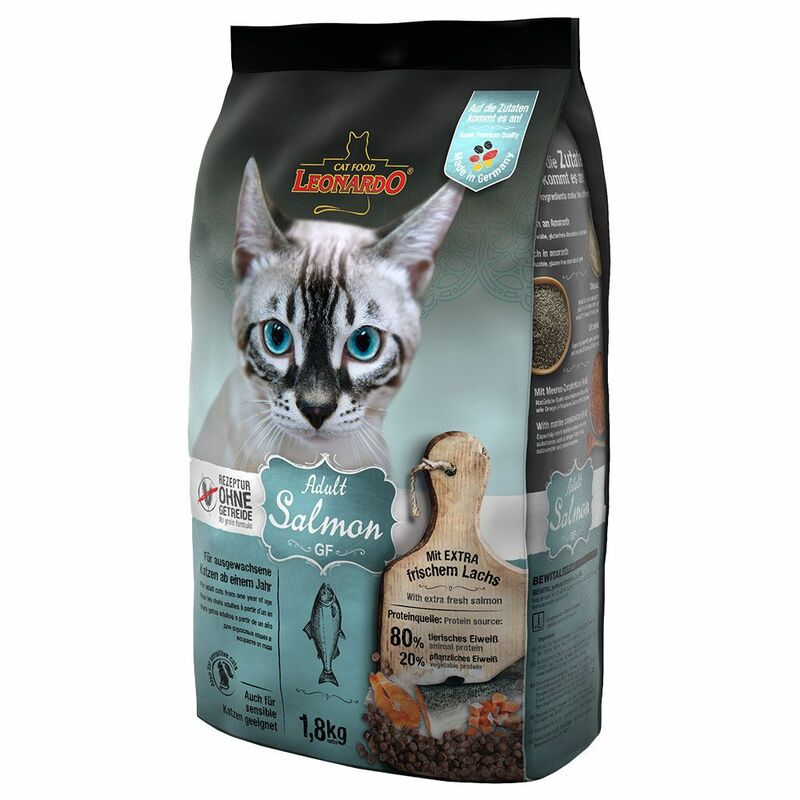 Leonardo Adult Grain-Free Salmon is a real treat for cats that enjoy fish. With 30% fresh salmon as well as dried seafood and Atlantic crustaceans (krill), this dry kibble contains plenty of high quality protein, and is also high in unsaturated Omega fatty acids that help to give your cat healthy skin and a shiny coat. In combination with other ingredients, this healthy dry cat food gives your pet a variety of different eΒential nutrients to help promote wellbeing and healthy organ function. Cats with sensitive digestion, allergies or food intolerances will benefit from this dry cat food's special grain-free recipe. The "ProVital" nutrient complex helps to stimulate your cat's natural defences using beta-glucans from brewer's yeast. Cold-preΒed grapeseed oil is rich in polyphenols that can help to protect against cell damage. The food has been specially formulated to balance your cat's urine pH, which can help to prevent urinary tract infections and ease the transit of swallowed hair and hairballs through its digestive tract. The ingredients of Leonardo Adult Grain-Free Salmon Dry Cat Food ensure a balanced diet for your cat, along with a great tasting meal. The kibble also has a special "stay clean" function, with soluble vitamin C that can help to prevent the spread of plaque bacteria. Leonardo pet foods: The ingredients make the difference! Leonardo Adult Grain-Free Salmon dry cat food at a glance: Balanced and complete dry cat food for adult cat aged 1 year plus Specially adapted recipe to suit cats with sensitive digestion Free from grains and gluten: can also be used with cats that have allergies or food intolerances 30% fresh salmon, seafood and krill: a source of high quality proteins and unsaturated Omega fatty acids, that help to promote healthy skin and a shiny coat 80% animal and 20% plant-based proteins: ideal nutrient combination and a good source of energy ProVital: natural beta-glucans from yeast cell walls that help to stimulate the cat's natural body defence systems, for a stronger immune system and better defences With grapeseed flour: rich in polyphenols that offer cell protection With amaranth and potato: gluten free alternatives to grains Chia seed: supports good digestion with natural mucilages and Omega fatty acids. Helps your cat to feel full without overloading ist body systems Krill: sea plankton – a source of many eΒential nutrients such as astaxanthin, omega fatty acids, antioxidants, vitamins and enzymes Gentle hairball exit: recipe that eases the transit of swallowed hair through the digestive tract Urine pH-balance: ingredients ensure an optimal urine pH, to help to prevent urinary tract infections Kibble that helps to clean teeth: StayClean formula with soluble vitamin C that can help to limit the spread of plaque bacteria STAY-Clean: concentrated active ingredient with vitamin C, that has been proven to help fight the spread of bacteria that form plaque as well as leΒening the build-up of tartar.